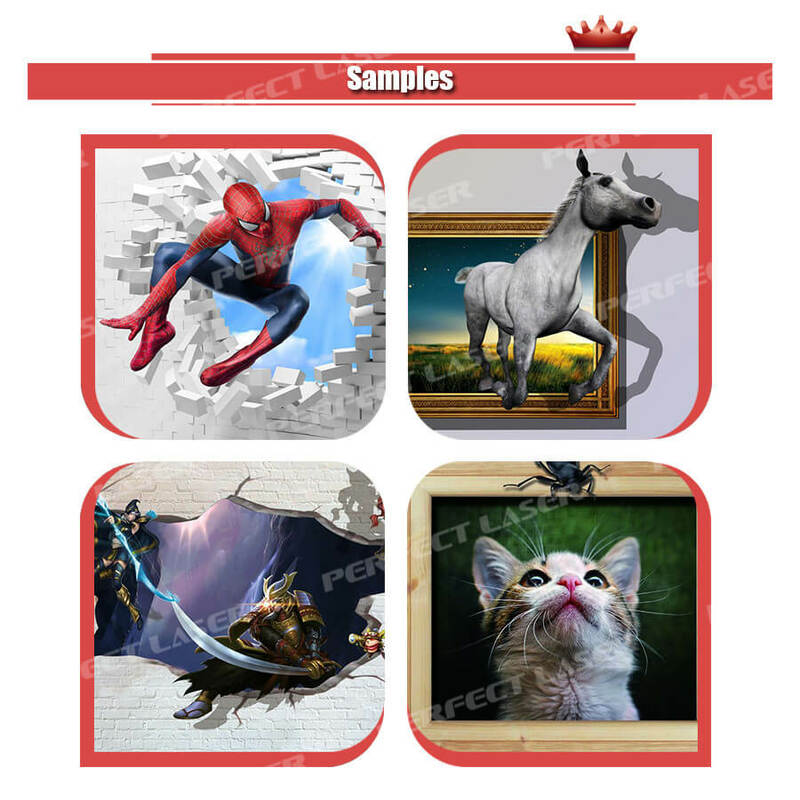 Perfect Laser is a professional manufacturer engaged in the research, development and production of wall printing machine. In order to meet the different needs of different customers, Perfect Laser develops new generation industrial intelligent wall printing machine PE-S80. The design of industrial 3d vertical wall printer nozzle is different from that of conventional wall printing machine. It has a higher printing speed, can satisfy large-scale work for a long time, and is more stable in performance. 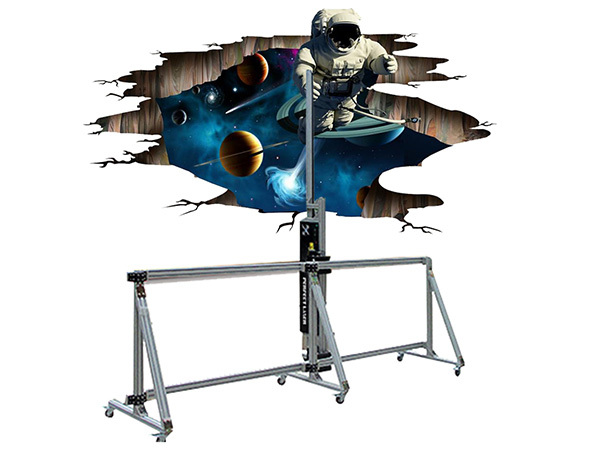 And the standard track of the wall printing machine can be up to 6M, more widely used. 1. Aluminum-magnesium alloy wall printing machine body, which has higher strength, high structural accuracy, light weight and durability. 2. The actual printing size of the inkjet printer for wall mural: height 2000mm, the track standard width is 6m and the 3d vertical wall printer can be extended if need. 3. High-precision brushless servo motor control system, vector positioning, no strip grating, motor brushless, (avoids cleaning, maintenance, garbled graphics after wear, need to be replaced regularly, etc.) to achieve higher painting accuracy, faster painting speed, and maintenance-free of the inkjet printer for wall mural. 4. The inkjet printer for wall mural using high-definition piezoelectric ink jet technology, high precision, high speed, and durability. Special designed nozzle for industry usage. 5. Adopt VSDT variable ink drop technology, supporting a new program algorithm, the smallest drop of 3d vertical wall printer is 3.5PL, the largest 47PL. The combination of advanced ink drop control method with high fault tolerance feathering technology ensures the output quality is more perfect and the 3d vertical wall printer can adapt to the painting of more special materials, such as: interior and exterior wall putty wall surface, latex paint wall surface, big white, imitation porcelain wall Surfaces, tiles, glass, rice paper, canvas, wall clothing, color coating glaze, shell powder, color grain paint and other walls. 6. The sprinkler data signal of the inkjet printer for wall mural adopts optical fiber integrated transmission (its advantages are: faster speed, strong anti-interference ability, high reliability, more stable transmission data). 7. Automatic breakpoints memory, automatic recovery of the starting position. The inkjet printer for wall mural can continue to start tomorrow and there is no need to reset, the wall printing machine is equipped with built-in UPS power supply, automatic charging, automatic switching to built in power supply. 8. Self-developed CPLD programmable logic control system, after years of practice, stable performance, in line with military-grade standards. 9. Advanced AC servo control technology to ensure more high-precision printing, better stability and longer service life of the wall printing machine. 10. Integrated head design and separable structure of the wall printing machine is effectively avoid the damage caused by bumping in the carriage. 11. All-round nozzle protection mounting plate, effectively reducing the damage rate of the wall printing machine nozzle. 12. Simple multi-color ink cartridge ink supply system, stable, convenient, quick and easy to support water and electricity separation of the inkjet printer for wall mural. 13. The improved ink absorber has good sealing performance, high cleaning efficiency of the 3d vertical wall printer nozzle, less ink consumption, and strong adsorption of the ink absorber, and should not be dropped. 14. 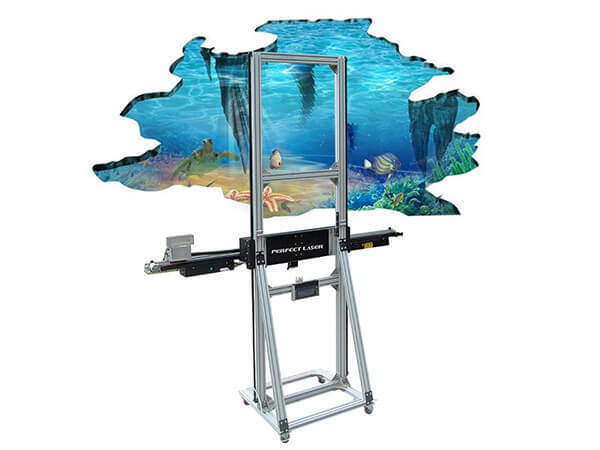 The inkjet printer for wall mural using the United States imported sensor system, dual sensors, two-way induction up and down, surface tracking, automatic positioning, automatic solution to the uneven wall, wall tilt and other issues, effectively reducing the risk of damage to the inkjet printer for wall mural head. 15. The output module was upgraded and the output of industrial models increased by 1 time. The wall printing machine is widely applied in interior and exterior wall putty walls, latex paint walls, white, imitation porcelain walls, tiles, glass, rice paper, canvas, wall clothing, color coating glaze, shell powder, color grain paint and other walls. Brushless motor with no grating bar,non- grating strip cleaning, Free of maintenance.